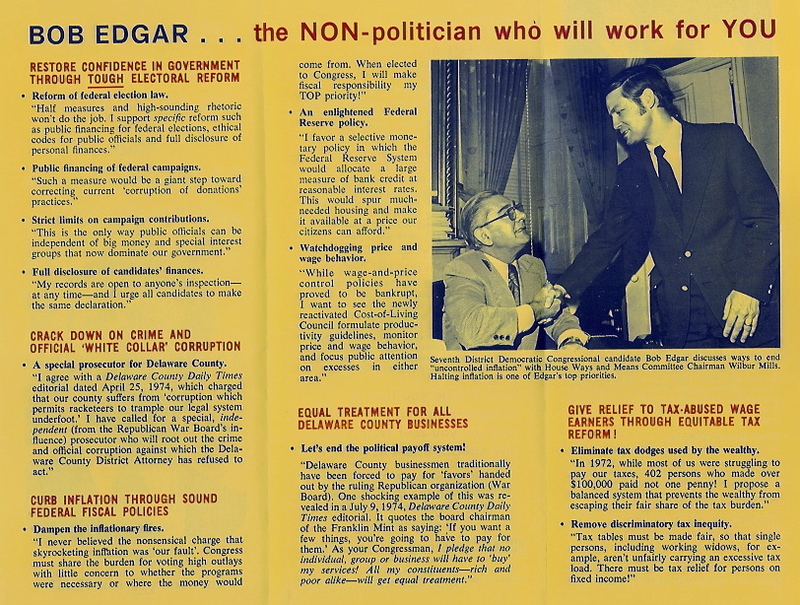 In 1974 the Republican machine still controlled Delaware County, and the War Board monopolized local politics. The break came when the public became outraged over the Watergate scandal. What fired me up was when President Nixon demanded the resignations of Attorney General Richardson and his deputy William Ruckelshaus. 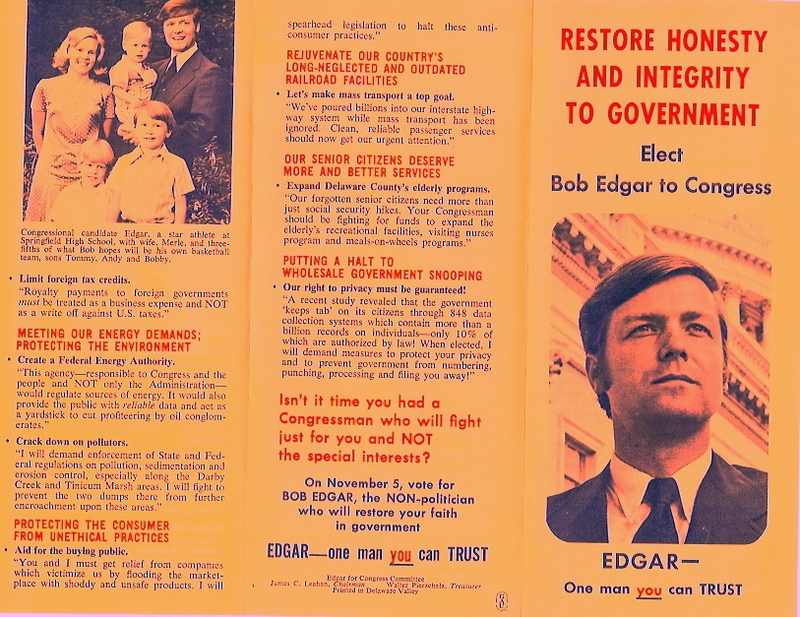 Bob Edgar, a Methodist minister, decided to run for the 7th Congressional seat, and I signed up to join his campaign. 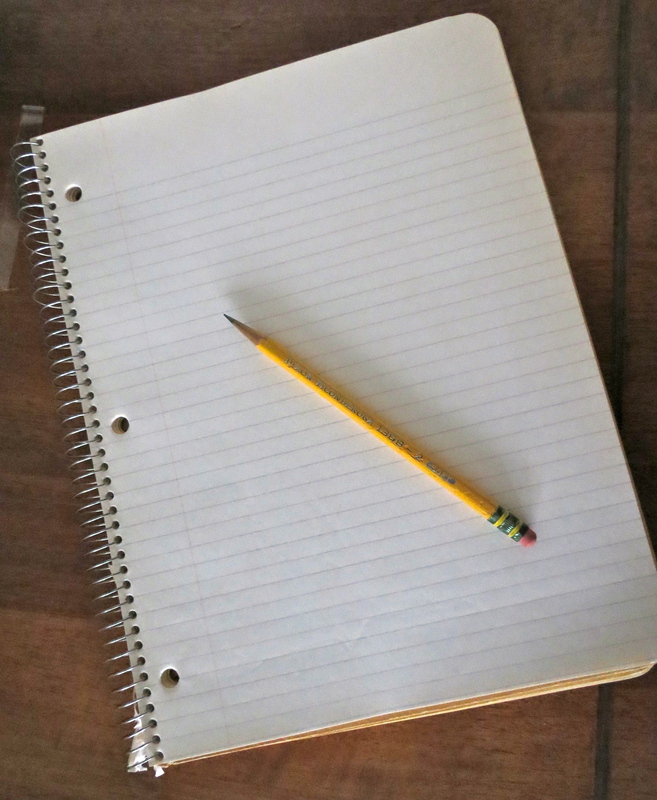 I wrote several letters to the local newspapers. The first letter was published in The Evening Bulletin, June 15, 1974, Saturday Forum: Bulletin Readers Speak Out. 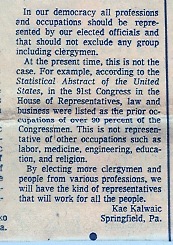 The subject was Church and State: Clergy in politics, in favor and against. 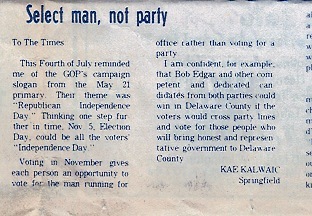 The second letter appeared in the Delaware County Daily Times, Friday, July 5, 1974. 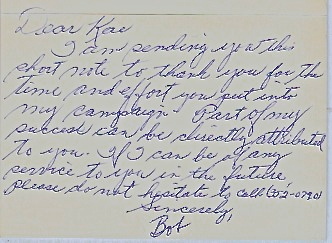 Undaunted, the campaign soldiers solicited friends, neighbors and family members to help Bob’s campaign. We were determined to keep the momentum going. I signed up to distribute campaign literature outside the polls at the old Central School in Springfield on Election Day. 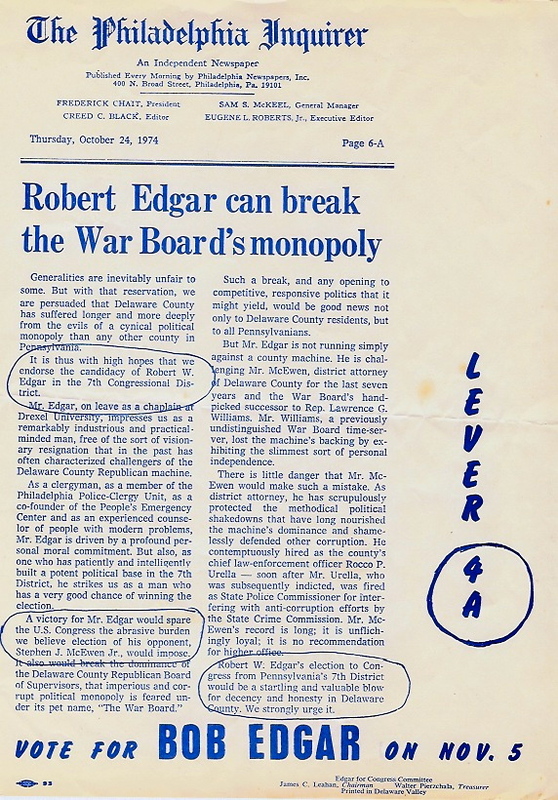 After the polls closed, my job was to call in the voting tallies to the Edgar headquarters. That evening after the voting was complete, I held my breath as they opened the voting machine and read the numbers. Bob had won with a clear majority. 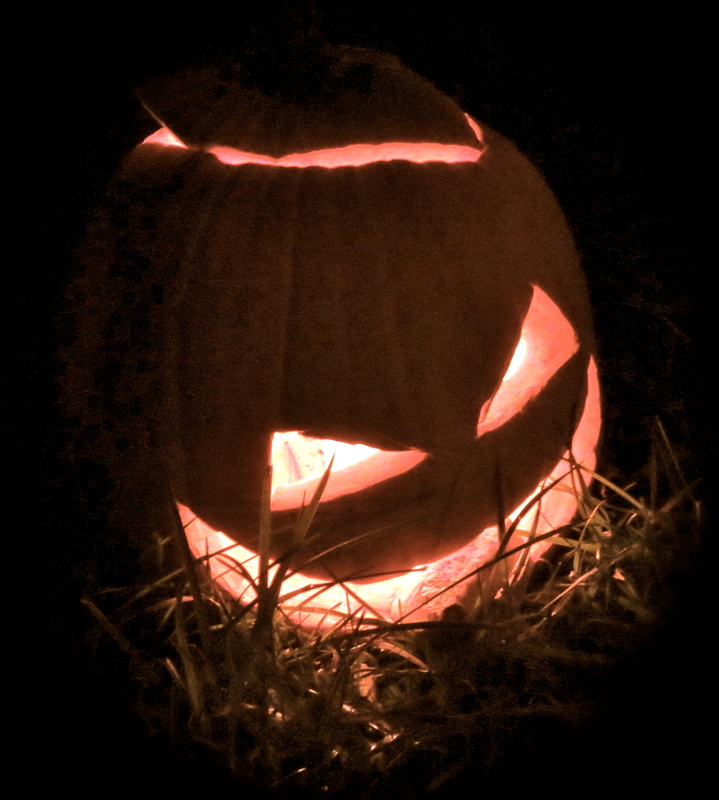 I called in the tallies, and headed over to the headquarters. We were still waiting for final results to come in from the other precincts when Stephen McEwen entered the room with his entourage. I could hardly believe Steve was conceding as we expected a long night of vote counting. The joy of the victory spread through the crowd as we shared that moment of celebration with each other. Bob passed away on April 23, and his contributions to Common Cause, as well as his accomplishments when serving six terms as a progressive congressman, are being remembered in The New York Times, the Nation and Huffington Post. 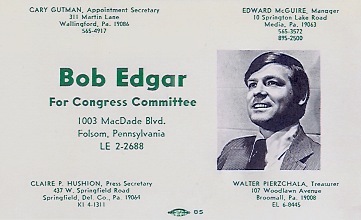 For me, Bob’s greatest legacy is when he stood with the people of the 7th Congressional District to restore democracy from control of one-party rule. Was only 70 Years Ago . 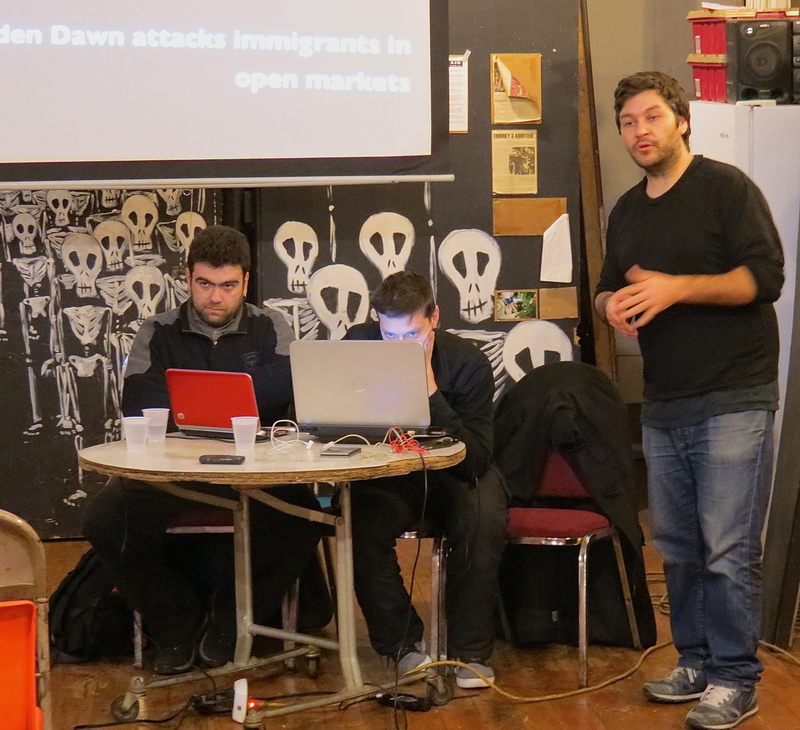 . .
My son, John, and his housemate, Jim, hosted two Antifascist activists from Greece, who were giving a presentation at the Lava Space in Philadelphia on Monday, March 11. John and Jim attend many activist events, and they always invite me to come. I decided to attend this event mostly because of an email I received just a few days ago from a member of my photography class who traveled to the Czech Republic on a family heritage trip. In that email he wrote that he had visited the town of Vrbove and walked the along the streets that were so familiar to his grandmother. He also made a pilgrimage to the town on Lidice, on the outskirts of Prague, to view the memorial there. I hadn’t heard of this town or the Lidice Memorial site so I checked out the details on the web. In 1942 the Nazis marched into Lidice and killed every male over the age of twelve and deported the women and children to the camps. They burned and leveled the village. The Nazis brought on further horrors which I cannot even bear to write about. The Nazis carried out this atrocity as revenge for the assassination of General Heydrich by unknown assailants. This chance intersection with the Lidice Memorial underscored the heroic efforts of the Greek Antifascists. When elements of fascism raise the specter of blatant racism, blaming targets of their hate for the economic failures while undermining democracy through brute force and suppression, citizens must take note. 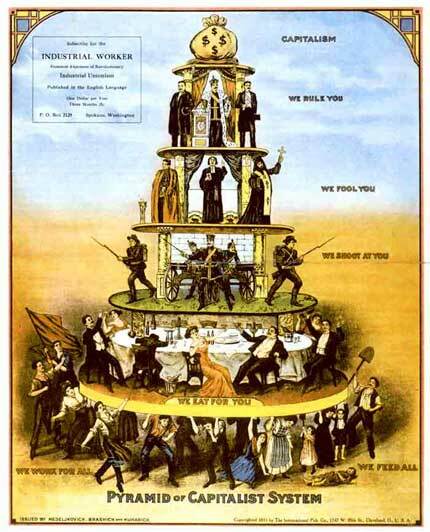 The Antifascists remind us that we must be aware of fascist propaganda, which scapegoats on immigrants and multiculturalism, taking advantage of economic crises to fuel the fires of discontent in times of austerity. 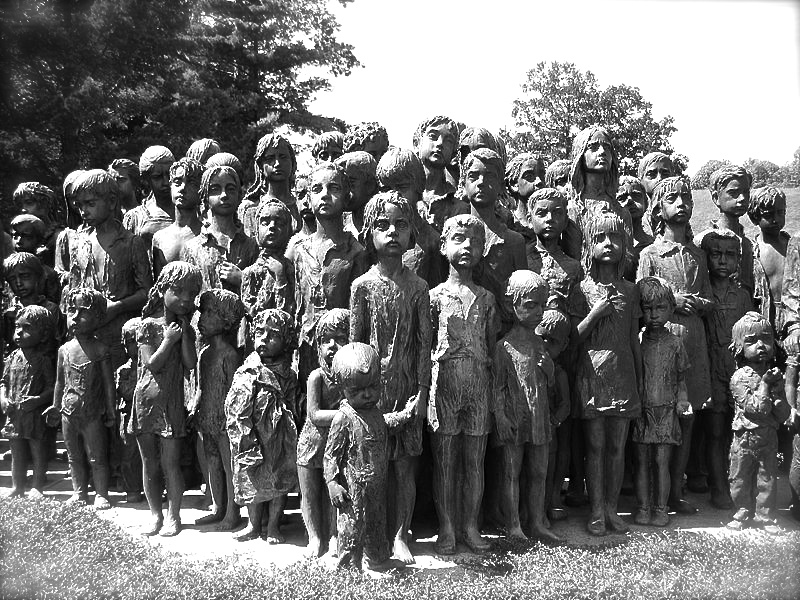 Without vigilance to these seeds of discontent, the horrors of Lidice could revisit the human race again. Austerity measures in Greece, with the goal of paying off astronomical debt, have created nationwide protests. Greece is suffering with unemployment at 27%. The Golden Dawn, described by both the media and scholars as fascist and neo-Nazi, won 7% of the seats in parliament and colluded with police to initiate violence against progressive activists and immigrants. Golden Dawn is opening branches in towns all over Greece and regularly coming third in national opinion polls. Its black-shirted vigilantes have been beating up immigrants for more than three years, unmolested by the police; lately they’ve taken to attacking Greeks they suspect of being gay or on the left. MPs participate proudly in the violence. Philadelphia was one stop on their scheduled visits to over 25 cities in the US to increase awareness and to raise funds for legal help. 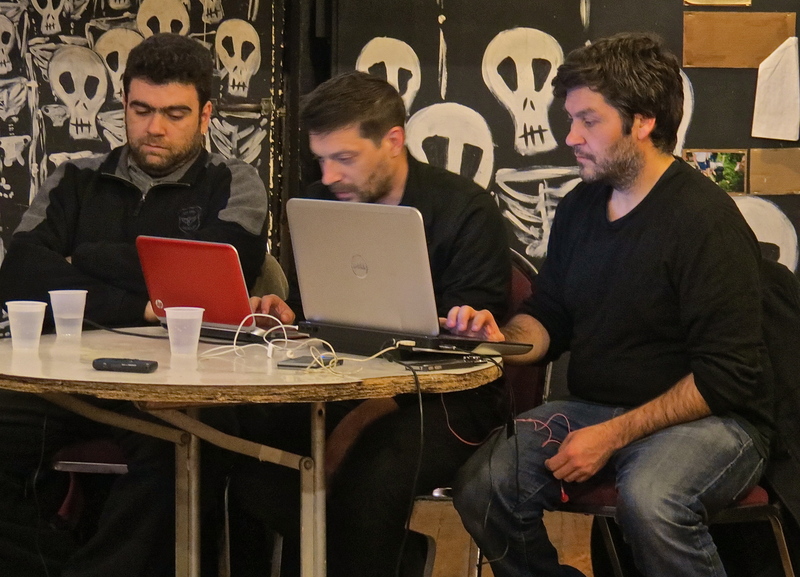 Greek activists, Thanasis Xirotsopanos and Vangelis Nanos, spoke to folks at the Lava Space about fascism and resistance in their country. Sofia Papagiannak gave her presentation via the computer as she had to return to Greece. Video footage provided documentation of the Antifascist resistance to the Golden Dawn.